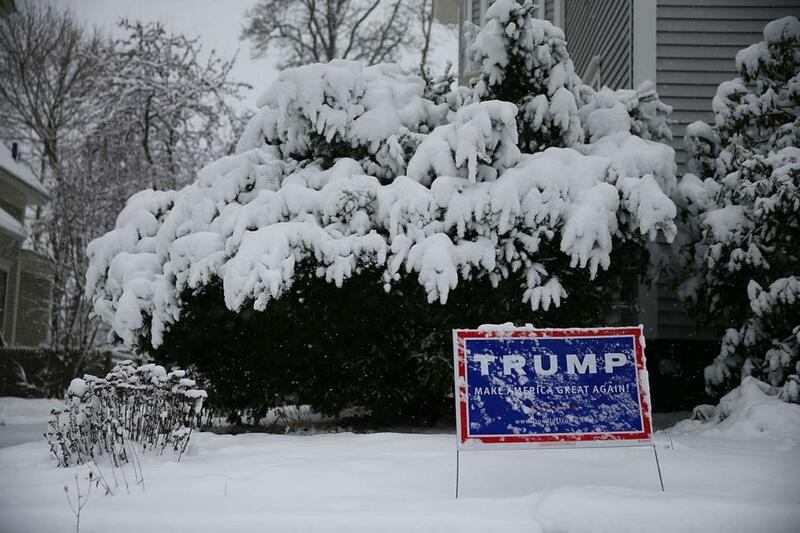 New Globe poll shows Rubio closing in on Trump in N.H.
A campaign sign for Republican presidential candidate Donald Trump is seen during Friday’s storm in Concord, N.H.
PORTSMOUTH, N.H. — Front-runner Donald Trump holds a nearly 10 percentage point lead over his rivals in New Hampshire’s Republican primary race, but Senator Marco Rubio is closing the gap in the final days, according to a new poll released Friday. Twenty-nine percent of voters surveyed said they backed Trump, and Rubio of Florida took second place with 19 percent. That’s the highest level of support Rubio has shown in any public survey since Trump entered the race in the summer. The Suffolk University/Boston Globe survey also showed former secretary of state Hillary Clinton in striking distance of Senator Bernie Sanders, who has a 9 percentage point lead in the Democratic primary. A sizable majority of Democrats seem to have made up their minds, and a smaller portion of Republican voters questioned said they were certain of their choice in Tuesday’s primary. While 33 percent of Republicans in the poll said they could change their minds over the closing weekend, just 13 percent of Democrats said the same. In the Republican race, Ohio Governor John Kasich placed third in the poll with 13 percent, former Florida governor Jeb Bush had 10 percent , US Senator Ted Cruz had 7 percent, New Jersey Governor Chris Christie fell to 5 percent, and Ben Carson had 4 percent. Cruz won Monday’s Iowa caucuses, while Trump had a disappointing second-place finish, and Rubio finished closely in third. Trump has led every poll of the New Hampshire primary since he announced his campaign. The poll also showed that Sanders, who is from neighboring Vermont, leads Clinton, 50 percent to 41 percent, with 8 percent undecided. The key factor contributing to Sanders’ lead over Clinton is his advantage among independent voters, who favor him over Clinton, 57 percent to 30 percent. Sanders also leads among men, 59 percent to 30 percent, and in the areas along the Vermont state line, 60 percent to 32 percent. One complication, according to Paleologos, is whether independent voters are drawn into the Republican primary. That adds to the volatility in predicting Tuesday’s results. Independent voters can take either a Republican or Democratic ballot on primary day. In the last Suffolk University poll of New Hampshire voters, released before the Iowa caucuses, Sanders also led Clinton by 9 percentage points. This is the first time the poll did not include former Maryland governor Martin O’Malley, who dropped out of the presidential race Monday. Also before the caucuses, a Suffolk University survey of New Hampshire likely Republican voters showed Trump with 27 percent, Cruz and Kasich each with 12 percent, and Rubio with 10 percent. This week’s survey shows Rubio rising, Christie falling, and Kasich and Bush firmly holding onto their slice of supporters. Women appear to be fueling Rubio’s rise in the poll. One in four New Hampshire women back Rubio, the highest percentage of any GOP candidate in the field. The poll also shows Rockingham County — which includes Salem, Derry, and Portsmouth — will be a battleground area between Rubio and Trump. One in four registered Republicans live in Rockingham County, and the poll showed half of voters there are with one of the pair. Trump leads Rubio there, 30 percent to 21 percent. As for the Democrats, the Sanders and Clinton contest could be decided in Hillsborough County, which includes Manchester and Nashua, and is where Sanders hold a 6-percentage point lead. The survey also found a significant difference in the way voters in the two primaries feel about backing the current front-runners in the general election. Only half of Republican voters said they would be “enthusiastic” or “satisfied” with Trump becoming the nominee. However, 71 percent of Democrats said the same thing about Sanders, and 68 percent of Democrats said that about Clinton. 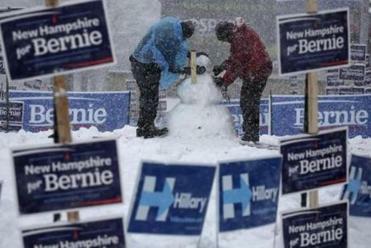 The poll also probed how the New Hampshire Democratic voters view themselves politically — potentially important in a race that features Sanders, a democratic socialist, and Clinton, who seeks to be the first woman president. Thirty-one percent of likely Democratic voters said they would call themselves socialists; 51 percent said they consider themselves to be feminists. Forty-nine percent answered they were “anti-Wall Street,” and 42 percent said they were not. The survey sampled 500 likely voters for each party’s primary. The GOP poll was taken Wednesday and Thursday, and the Democratic poll was taken between Tuesday and Thursday. The margin of error for both surveys is plus or minus 4.4 percentage points. James Pindell can be reached at james.pindell@globe.com. Follow him on Twitter @jamespindell or subscribe to his daily e-mail update on the 2016 campaign at www.bostonglobe.com/ groundgame.